A man has died in a Wolverhampton street, sparking a murder investigation. 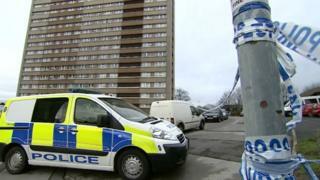 The man, aged in his 20s, was found fatally injured by police in Chadwick Close, Merry Hill, at 18:20 GMT on Tuesday. Paramedics worked on him at the scene but he was later pronounced dead. West Midlands Police said a cordon was put in place while inquiries were carried out. No arrests have been made. Neighbours said it was "tragic" and "horrifying" a young man had lost his life. Det Ch Insp Edward Foster said: "A man has sadly lost his life and we are working to establish the circumstances around what happened.